This is an edited version of Nemani Delaibatiki’s My Say in the 4 the Record programme last night on FBC TV. The many positive things we look forward to in 2018 have been tainted by the unresolved illegal strike by some ATS workers. It started in December and has spilled over to the New Year. 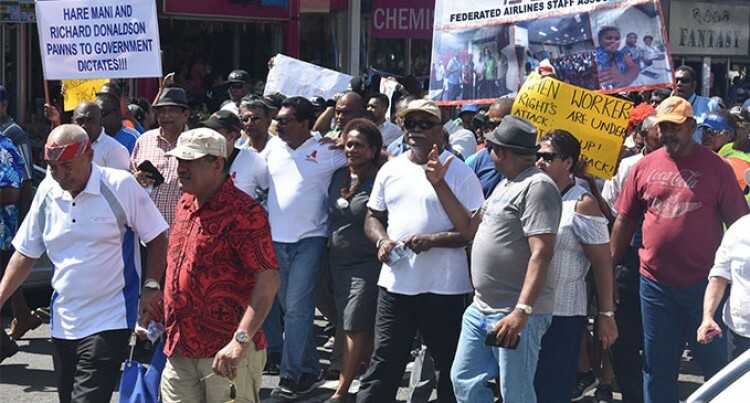 The Fiji Trades Union Congress-organised march on Saturday has escalated the dispute to a new level. The striking workers are now saying through their union reps that they will not return to work if their demands are not met. The ATS management wants the workers to return as soon as possible while an independent mediation is instituted to try to resolve the dispute. What had started as an illegal walkout has taken on a political complexion and a life of its own. It has spun out of the workers’ control into the hands of some trade unionists and politicians, who are capitalising on this row to raise their profile. The poor strikers are now being propped up by donations of food, kava and cash to give them a sense of confidence and security and to press forward with their demands. But this help is only temporary and fails to address the core issues that the striking workers are complaining about. Those who claim to support them and have the workers’ interest at heart should say “here’s help, here’s some food and cash. Go back to work and get your union to return to the negotiating table through mediation”. Instead they are encouraging them to continue their strike. These issues will only be resolved at the negotiating table not at the picket line. The march and the activities at the picket line are just a show and they will not resolve this dispute. It’s all about the trade unions and their political cohorts flexing their muscle at the expense of some of the striking workers. ATS board chairman Riyaz Sayed-Khaiyum yesterday set the record straight when he outlined the sequence of events since December 16 when ATS staff “stopped work without notice, left their place of work and went to attend an ATSET meeting”. They were then stood down and given show cause letters when they tried to recommence work a few hours later. But the problem started when the union stepped in and advised the workers not to sign the letters. Mr Sayed-Khaiyum explained that the staff were wrongly advised not to take any responsibility for their illegal walkout. The union action was unacceptable because it encouraged its members not to follow the rules and procedures. It is in contradiction to the principle of accountability, fair play, the rule of law and transparency that it advocates. That’s why the Minister for Employment, Productivity and Industrial Relations, Jone Usamate, declared the walkout illegal. The grounds for that decision are pretty clear. This was a very simple dispute that could have been resolved weeks ago. But it has now become clear that the ATS strike is the stepping stone to a bigger battle. If you listened to the rhetoric at the rally at the Nadi District School ground after the march on Saturday, it was revealed that the ultimate goal was to topple the FijiFirst government at this year’s general election. One would ask what has the ATS dispute got to do with trying to defeat the Government? When the ATS dispute is politicised, it blurs the real issues and complicates matters. That’s the problem.